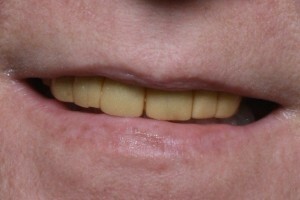 Dental problems can negatively influence one’s quality of life, and many patients come to us looking for solutions. 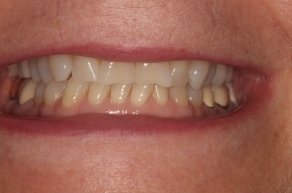 At OC Lifesmiles Progressive Dentistry, we are happy to partner with you in changing your life for the better by improving the condition and appearance of your teeth. Recently we had the pleasure of meeting a patient, “Rachel C.”, through the American Academy of Cosmetic Dentistry Charitable Foundation’s Give Back a Smile program. Give Back a Smile is composed of volunteer dentists who repair dental injuries for patients who are the victims of domestic violence and sexual assault. 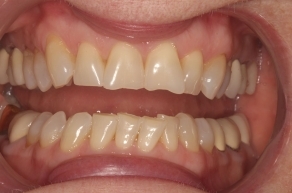 Rachel came to our Newport Beach dental office with extremely broken and decayed front teeth. Due to her lackluster smile, she was very self-conscious about smiling and felt uncomfortable around other people. As a result, this held her back from reaching her full potential. Although she wanted a new job, she didn’t have enough confidence to go on job interviews. 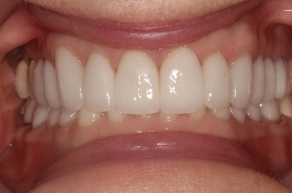 Finally, Rachel told us she was tired of being isolated and wanted to discover how she could fix her damaged teeth. 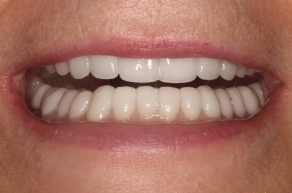 Our cosmetic dentist, Dr. John Cross gave Rachel a comprehensive oral evaluation and determined that a complete Smile Makeover was the best solution. This treatment involves a combination of procedures that can resolve a number of problems and give patients a healthier, more beautiful smile. Our next blog will explain the treatments Dr. Cross performed to help Rachel achieve a new smile and ultimately change her life. Please contact our office for more information, or to arrange a consultation with Dr. Cross.